Royal Never Give Up (on picture) takes a bow as they eliminated former rivals Snake eSports, 3-1 in their best-of-5 Quarterfinal date. Star AD Carry Jian (Uzi) Zi-Hao made history happen whilst leading Royal Never Give Up (RNG) to victory as he set a historic LPL record en route to their 3-1 stomp over Snake eSports (SS) in their best-of-5 2018 LPL Spring Quarterfinal date to seal their semifinal slot at the Shanghai LPL Stadium in Shanghai, China, Saturday evening (Philippine time). 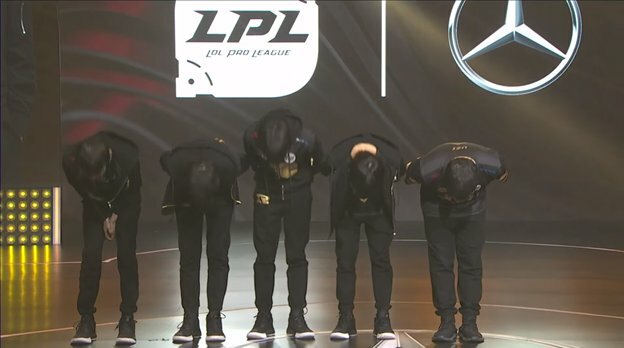 Jian, who started his professional career in 2013 and also known as the "Mad Dog" of the LPL due to his temper in-game finally propelled himself on top of the LPL kill standings after five years as he clinched his 2000th career kill in Game 2 of the four-game run where he, as Xayah killed SS's mid laner Zeng (Guoguo) Jun-Li in a SS base game-ending clash, thus making him the only player in LPL history to do so. But in spite of having this big title in the grip of his hands, he still managed to hard carry his team to the winning path, and he did it in the most bizarre way possible. Finishing the first two games with a flawless 14/0/7 Kill-Death-Assist (KDA) record, he still retained his lane aggressiveness in the next two games, resulting to the constant destruction of SS's bot lane duo of AD Carry Yang (kRYST4L) Fan and support Liu (Hudie) Yan-Zhu, despite losing to a traditional SS comeback in Game 3, concluding the series with a game-high 10.75 KDA Ratio (26/4/17 KDA). Veteran mid laner Li (Xiaohu) Yuan-Hao also provided enough poke damage to the 10-man RNG squad as his Swain, Galio, and Karma proved to a thorn to the opposition, co-leading Jian in kills through his 16 combined kills in the series (Jian leads with 26). RNG's resident top laner Yan (Letme) Jun-Ze, jungler Liu (Mlxg) Shi-Yu and sophomore support Shi (Ming) Sen-Ming also didn't fail to support their carries into their backs as their tanky and utility picks also boosted the team's frontline in the entire series, spearheading the team in the assists department with 100 merged assists and in the kill participation (KP) side with 59 percent (Liu leads with 81.35 percent). Meanwhile, although being stomped, Yang still paced SS, leading the 8-man veteran-filled squad in kills with 13 combined kills. With the win, RNG are now assured of acquiring at least 20 to 90 Championship Points, bagged the third Chinese seed to the upcoming 2018 Rift Rivals (vs. Korea and Taiwan), and will face the old Chinese powerhouse Invictus Gaming (iG) (37-5, 18-1 in set) this Saturday. SS, on the other hand, will garner 10 Championship Points, and end their Spring Split campaign in 5th/6th Place.